Article Snip: "...there were no winners of the jackpot estimated at a cool $215 million. "Because of a technical problem tonight, we are unable to bring you the Powerball drawing at this time..."
Article Excerpt: "... 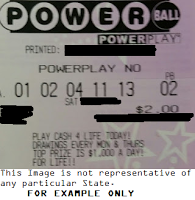 The numbers are 10-13-28-52-61 and Powerball 2. The game’s website says one winning ticket was sold in Indiana. WLFI-TV, citing Indiana lottery officials, reported that the winning ticket was sold in Lafayette ..."
Article Excerpt: "... No #Powerball jackpot winner. Wednesday's jackpot is a world record ..."
Article Excerpt: "... Powerball jackpot, never fear. There is another drawing on Saturday. Not only does Saturday's drawings bring more chances for life-changing decisions -- it also brings the jackpot to a record-breaking new high. Even though there was no grand prize winner on Wednesday night, there were ..."